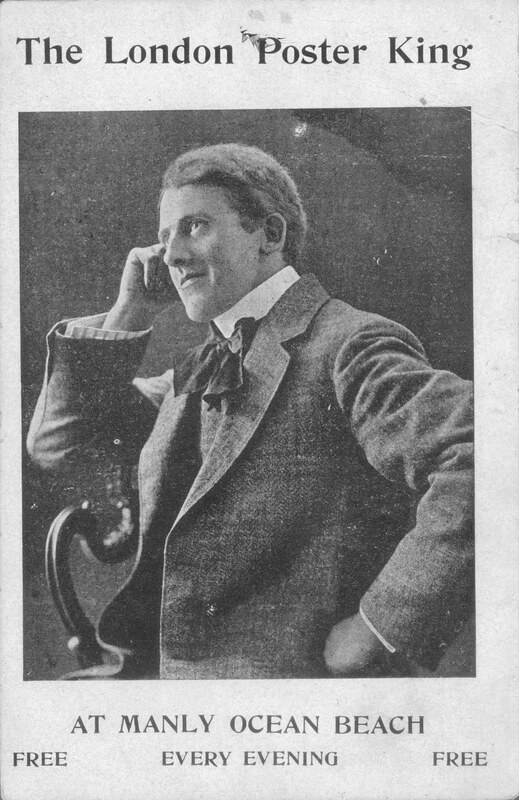 C Arthur Von Tosseau (or Arthur Niven Tossau or Arthur Tozzart and/or other name variations along the way) made his living for a large part of his life traveling around Australia performing as a sketch artist in public places such as the Manly Corso, as well as regional centres across the country as this advertisement from the Maitland Daily Mercury on 26 July 1923 portrays. 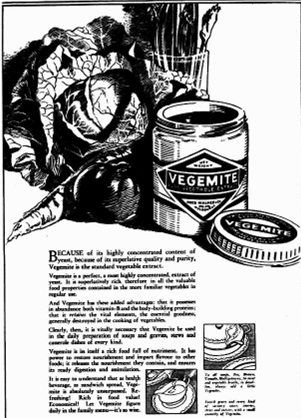 These examples of his work on advertising posters can be found in the collection of the State Library of Victoria. 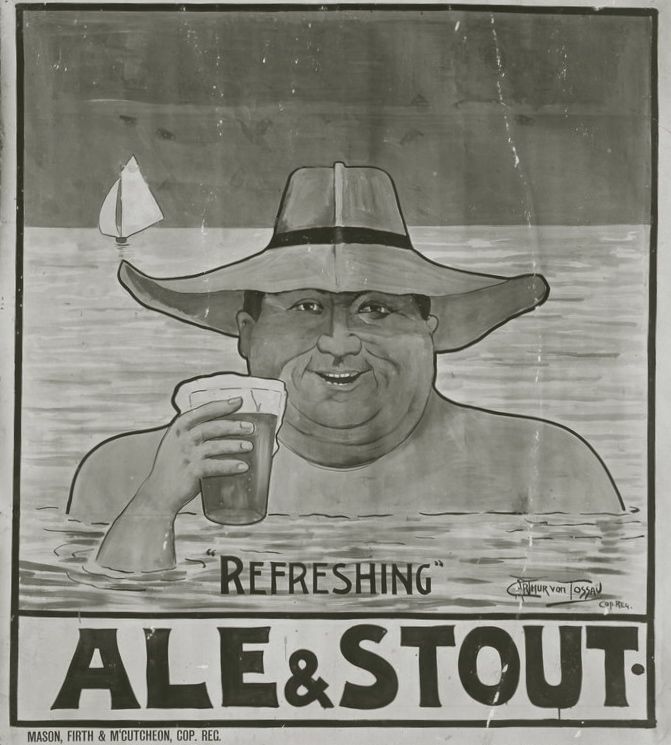 Fat man with Panama hat – Tossau, C. Arthur von & Mason, Firth & McCutcheon (1904) – isn’t clear about the brand of ale it’s advertising although it does look like a good place to be at this time of year. 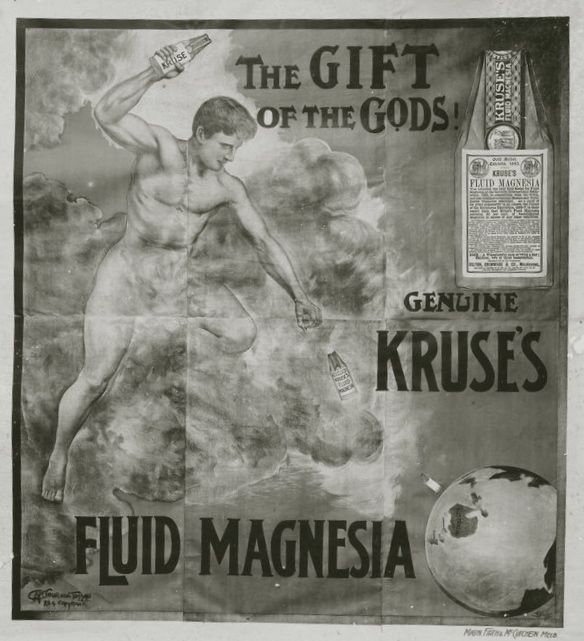 Magnesium hydroxide (milk of magnesia) never had such an ethereal treatment as with his The Gift of the Gods poster – Tossau, C. Arthur von & Mason, Firth & McCutcheon (1904). A tasteful use of cloud camouflage don’t you think? 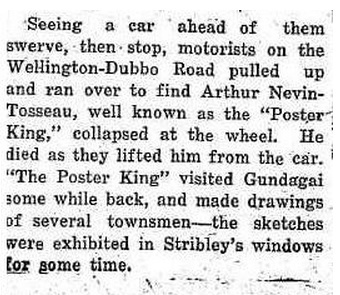 At the age of 54, while traveling with his Poster King show, Arthur Tosseau died at the wheel of his car. This account is from The Gundagai Independent and Pastoral, Agricultural and Mining Advocate of 9 May 1927. His story can be found in more detail on this link to Manly Library’s Local History blog. 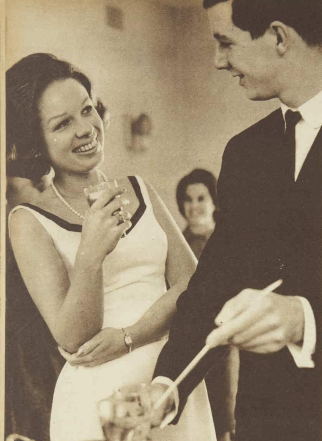 The photograph of Tosseau is also from that site. 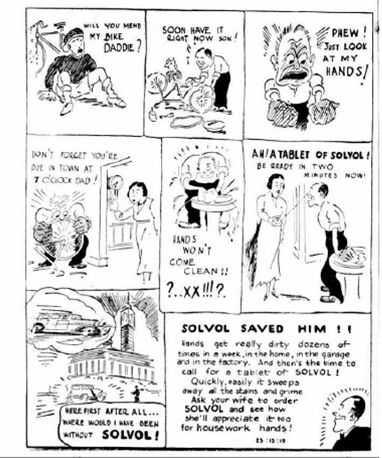 Check out the language in this 17 August 1930 Sunday Mail item. “Ironing is quite pleasant work”. 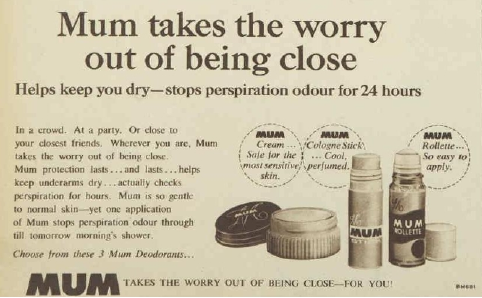 But we’ve come a long way haven’t we. Fast forward 80 years or so. 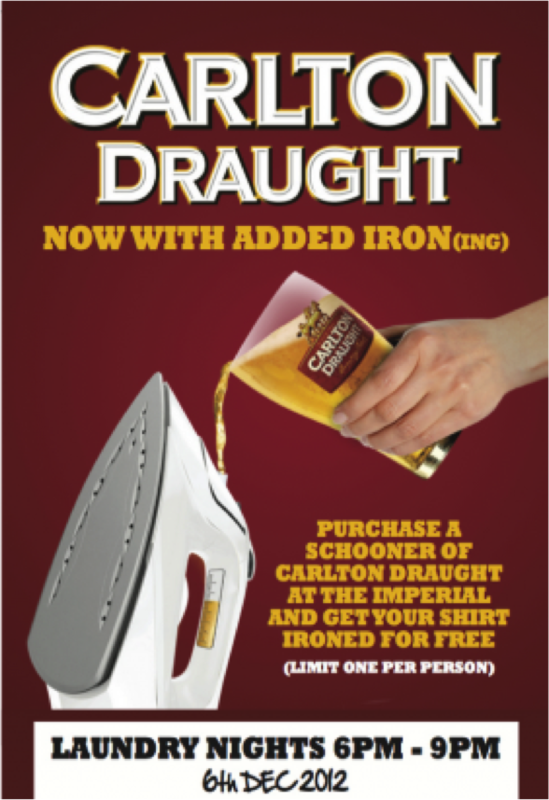 “Give the wife, girlfriend or partner a rest tomorrow night, because the Carlton Draught girls will be in to do your laundry (well your ironing anyway)”. There are no words fit to print. This pumice bar ‘soap’ was developed in 1915 to remove work based stains from your hands. It is still available today. 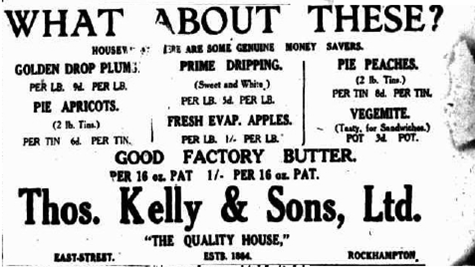 The spread based on brewer’s yeast was created in 1922. 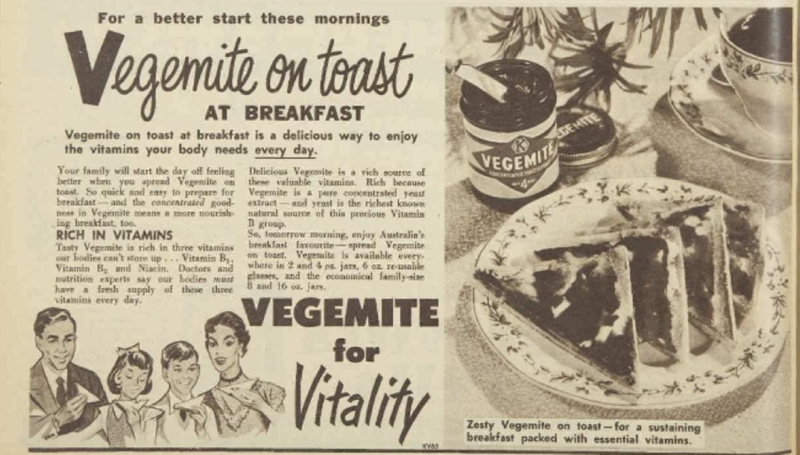 Here are some sample advertisements for Vegemite across four decades. 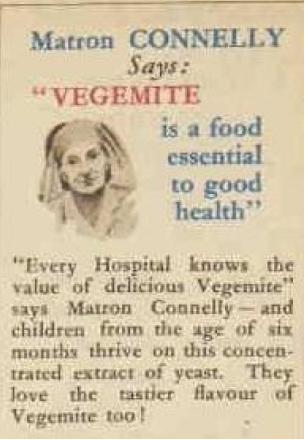 In the 1950s and 60s, magazine and newspaper advertising went personal with children being featured as Happy Little Vegemites. 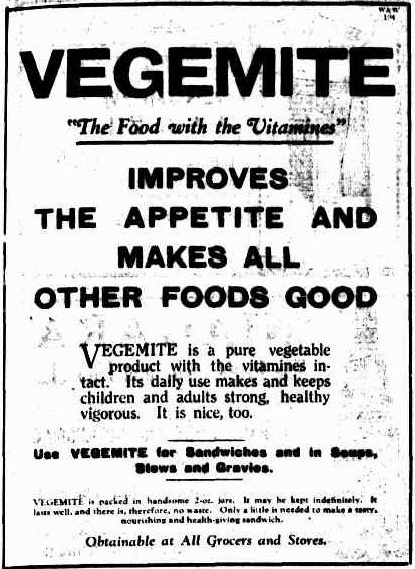 Go here for everything you wanted to know about Vegemite and its history. 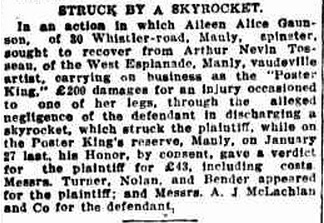 1920s – Argus 8 March 1924 and Rockhampton Morning Bulletin 3 December 1924. 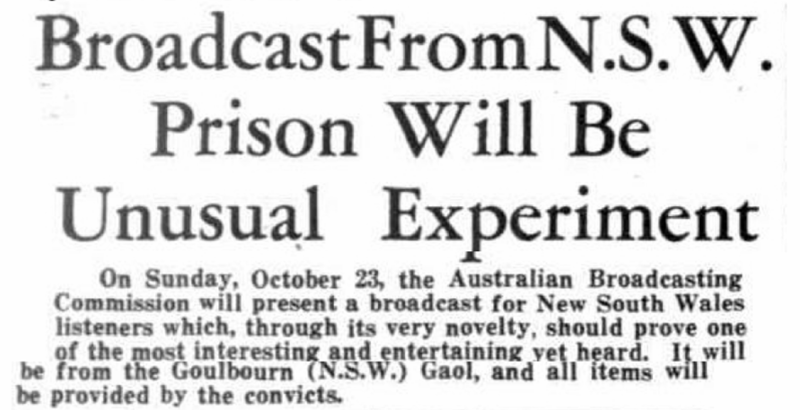 Musical items performed by prisoners in Goulburn Gaol (Jail) were broadcast as an experiment in October 1938 (The Mail). 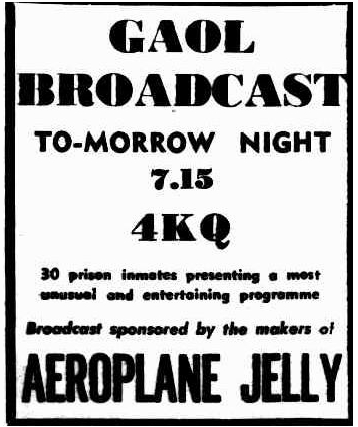 In 1952, commercial networks had taken up the broadcasts and Aeroplane Jelly was the sponsor. 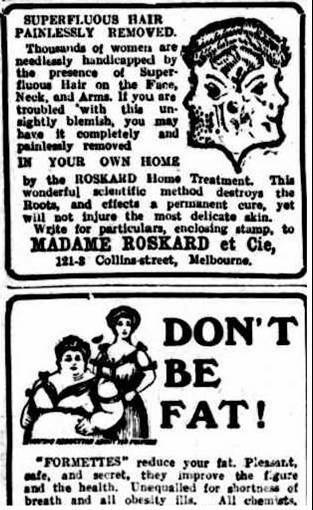 The Women’s Department of The Queenslander – 6 December 1919 attracted advertisements that could have dented the self-esteem of any modern woman. 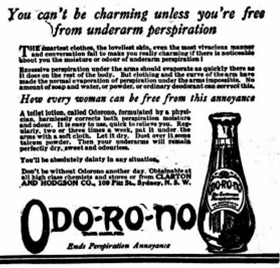 With the exception of a request from the Mitchell Library for the diaries of soldiers returned from World War I, the page is full of products designed to remedy the short-comings of being overweight, having superfluous or grey hair, hysteria, excessive perspiration, lice, ringworm and any number of undefined ‘female’ maladies.